MELBOURNE, Australia — China's second aircraft carrier, but its first locally built, has been floated off its dry dock, and its formal launch appears imminent, even as the country continues development work on other aspects of its carrier program. 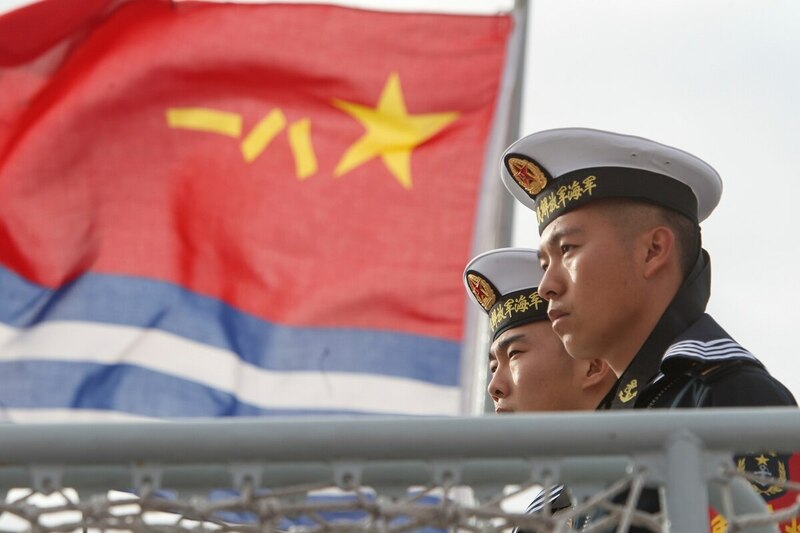 The floating of the ship began on the morning of April 23 with a small ceremony, which also likely served to commemorate the 68th anniversary of the founding of China's People's Liberation Army Navy, or PLAN. Recent photos show that the hull and superstructure of the ship have been fully painted; however, the ship, which is rumored but not confirmed to be named Shandong, has yet to be officially launched. The new carrier is based closely on the PLAN's sole operational aircraft carrier, Liaoning, with an angled flight deck and a ski jump for short takeoff but arrested recovery, or STOBAR, operations. The most significant change from the Liaoning would, however, be the reconfiguration of the phased array radar panels, with those on the new ship facing diagonally outward on both sides of bridge fore and aft. There have also been suggestions the new carrier's hangars have been reconfigured for more efficient below-deck aircraft storage, although this is not confirmed. Chinese news portal Sina had previously reported that the ship will have an aircraft capacity of 28-36 aircraft split between Shenyang J-15 fighters and helicopters, which is the same as that of the Liaoning. The Liaoning was the Soviet-era Kuznetsov-class carrier Varyag acquired by China in a semi-finished state in the late 1990s, refurbished and recommissioned into the PLAN in 2012. It has since conducted several at-sea cruises, which included air operations with J-15s and helicopters. This aerial photo shows China's second aircraft carrier in dry dock in December 2016. Euan Graham, director of the International Security Program at Australia's Lowy Institute, told Defense News that the use of STOBAR for its second carrier would indicate that any improvements in capability would likely be incremental, adding that the Liaoning and the new carrier will "remain essentially training vessels," although "the existence of a second carrier will give China much greater time at sea, and hence significantly boost the learning curve." Meanwhile, photos have emerged of the mock-up of the aircraft carrier at China's dedicated naval research and testing facility in Wuhan, Hubei province, showing a new mast and housings for radar arrays fitted on the superstructure. The mock-up had its ski jump removed in early 2016 for what is believed to be modifications for a systems and flight deck configuration test bed for China's third aircraft carrier, which has been tentatively designated the Type 002. The removal of the ski jump from the mock-up serves as additional confirmation of China's plan for its carriers to be fitted with catapults for launching aircraft. As Defense News previously reported, China has built two catapults at the PLAN air base at Huludao, Liaoning province, where its J-15s are based. Satellite photos show both catapults being used on separate occasions to launch J-15s and what appear to be a UAV. Fitting catapults will enable the PLAN to operate heavier aircraft from its future carriers, creating more well-rounded air groups that include airborne early warning and carrier onboard delivery aircraft, exponentially improving the capability of the PLAN's carrier forces and the types of missions it can carry out.